US Drought Monitor November 20, 2018. 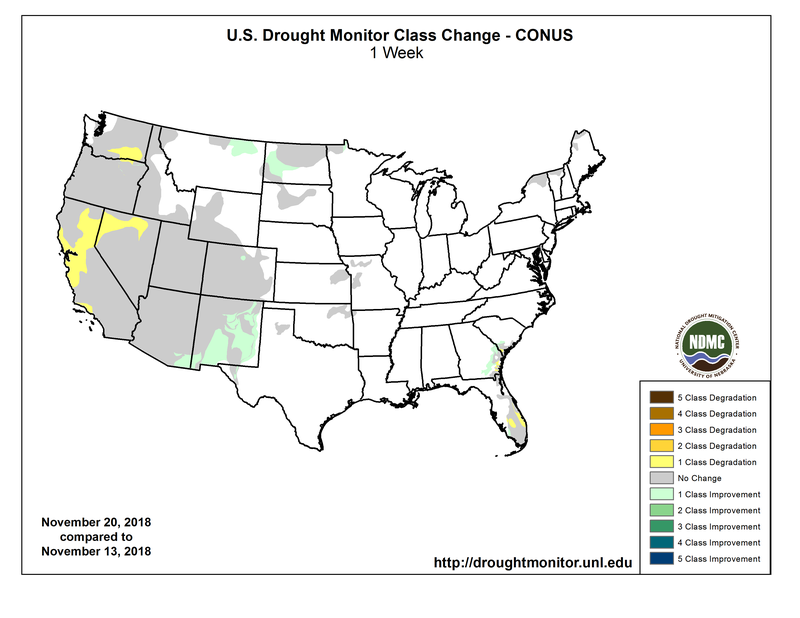 West Drought Monitor November 20, 2018. Colorado Drought Monitor November 20, 2018. Parts of western Washington received 0.5-1.0 inch of precipitation this week, with a few spots up to 2 inches, but outside of the Pacific Northwest, the West was bone dry. D1 expanded from northeast Oregon into southeast Washington where precipitation deficits were growing. The SPI showed moderately dry conditions there at many time scales from the last 1 to 24 months. In California, a number of indicators showed moderate drought or worse conditions across the state. These included the SPI, SPEI, KBDI, streamflow percentiles, soil moisture models, and groundwater indices, and low snowpack in the Sierra Nevada. Agricultural impacts collected by the University of California Cooperative Extension and the USDA indicated worsening conditions across parts of coastal, central, and northeastern California. These impacts included reduced pasture and forage, hauling of water, livestock stress, decrease in water allocation, increased fire danger, dry wells, and low ponds and springs. D1 was expanded from central coastal California, across northeast California and into northern Nevada, and a sliver of D3 was added to Santa Barbara and Ventura Counties, to reflect these conditions and indicators. According to November 18 USDA reports, topsoil was short or very short of moisture across 75% of California, 95% of Nevada, 66% of Oregon, and 48% of Washington. Except for northern California, reservoir levels in California were near or above average, indicating that the state’s water managers have done an excellent job managing water resources during the significant drought of the last several years. A Pacific weather system was poised to bring precipitation to the West Coast as this USDM week ended. Over the next 7 days, the Pacific weather system will move across the West, pushing the ridge further to the east, and reforming as a frontal system that moves across the Plains to East Coast, with another Pacific system moving into the West on its heels. The NWS WPC 7-Day Quantitative Precipitation Forecast (QPF) for November 21-27 calls for 3+ inches of precipitation across much of the West Coast from northern California to Washington, with half an inch to an inch or more further inland to the northern and central Rockies. The precipitation is forecast to miss most of southern California and the Southwest. Little to no precipitation is in the QPF in the northern and southern Plains, while a band of 0.1 to 0.5 inch stretches across the central Plains. The QPF has an inch or more of precipitation across much of the country along and east of the Mississippi River, with 2 inches or more in parts of the Gulf Coast and southern Appalachians to New England. The central part of the CONUS will get a shot of above-normal temperatures as the ridge propagates east, then below temperatures will return. The CPC 6-10 day and 8-14 day outlooks envision a ridge re-establishing itself across the West and a trough over the East. As a result, warmer-than-normal temperatures are expected across Alaska and the Rockies to West Coast, with colder-than-normal temperatures expected to dominate from the Plains to East Coast, except New England. November 26-December 4 is expected to be wetter than normal in Alaska, along the West Coast, along the northern tier states, in New England, and in Florida, and drier than normal across the southern Plains to Lower Mississippi Valley. US Drought Monitor one week change map November 13-20, 2018.